There's no need to wait for the Summer Sporadic-E "season" for 6M DX. The combination of Meteor Scatter (MS) and Weak Signal Digital Modes can provide regular contacts all year round. Random meteors arrive all the time, but reflections tend to peak in the morning, mainly from an easterly direction. In the morning, the daylight side of the Earth is moving in the same direction as our orbital direction around the Sun, so we are hitting the on-coming meteors at higher relative velocity, causing enhanced ionisation in the E layer. Reflections can be strong (similar to Es) but are generally of short duration, from a 1/4 second ping to a 2 second burst and occasionally up to 20 seconds or so with multiple bursts. From time to time we get Meteor Showers such as the Perseids (August) or Geminids (December), where the Earth passes through the debris of a comet's tale. These can provide even longer, more frequent reflections - but meteor showers are not always guaranteed. However, a predicted meteor shower will always guarantee increased human activity ! The optimum distance for reliable MS contact seems to be 900 - 1800 Km. Distances less than this tend to produce shorter pings which are not as easy to decode. 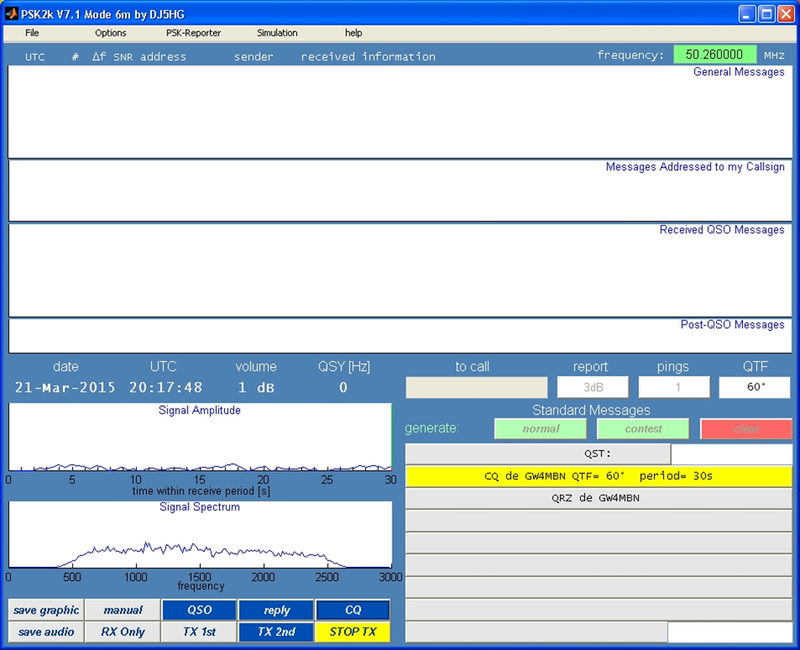 The WSJT software by Joe Taylor is the most popular for computer-aided MS work, and includes a number of "fast" and "slow" protocols, optimised for different types of propagation. 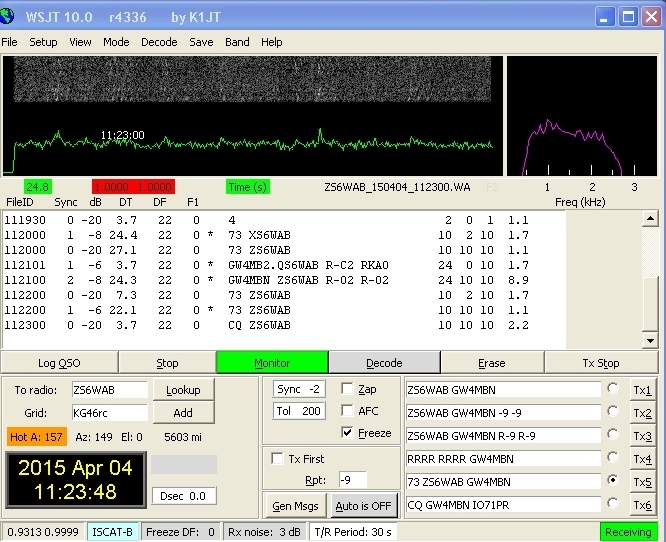 JT6M, ISCAT JTMS and FSK are the "fast" modes designed for weak signal meteor and iono-scatter. 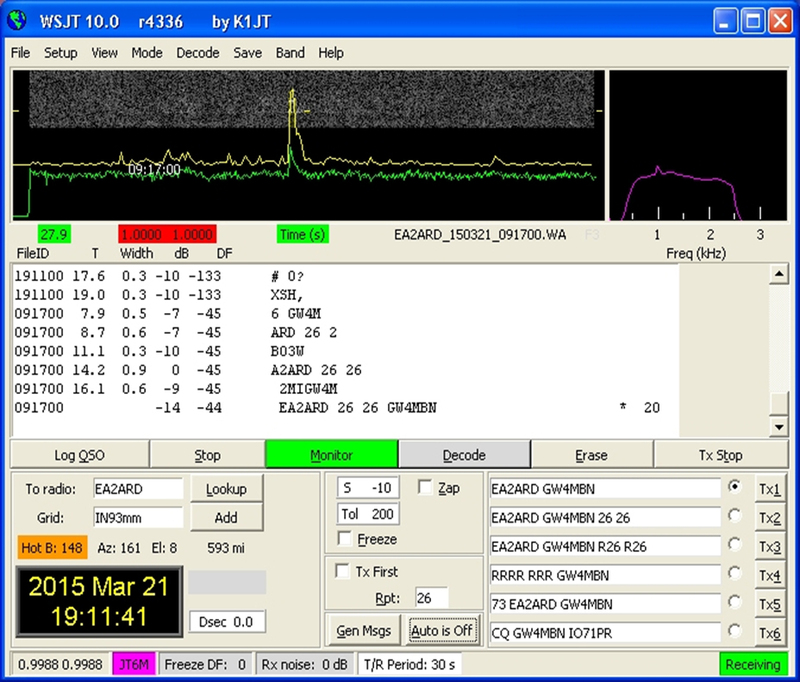 WSJT 10 is the current software version. This mode was optimised for MS on the 6M band and is still very popular in Europe. 50.230 Mhz is still the most popular calling frequency, though migration to the new band plan centre of activity on 50.320 Mhz is intended. is transmitted continually for 30 seconds (15 sec option). GW4MBN DH6JL 26 26 for thirty seconds. "Across the Pond" in North America, the signal reports 26, R26 are normally just transmitted alone, without the callsigns. The software can be setup for EU or NA style. The signal report 26 represents the duration and strength of the meteor burst. 26 means a duration of less than 0.5 sec and strength less than S2. This covers most "pings", but reports could sometimes reach 37 or even 48. By left-clicking the mouse on a visible burst or ping in the spectrum display, you can decode the message or part of the message during the 30 second transmit period. You can also wait until the end of the period and allow the software to calculate the best average. 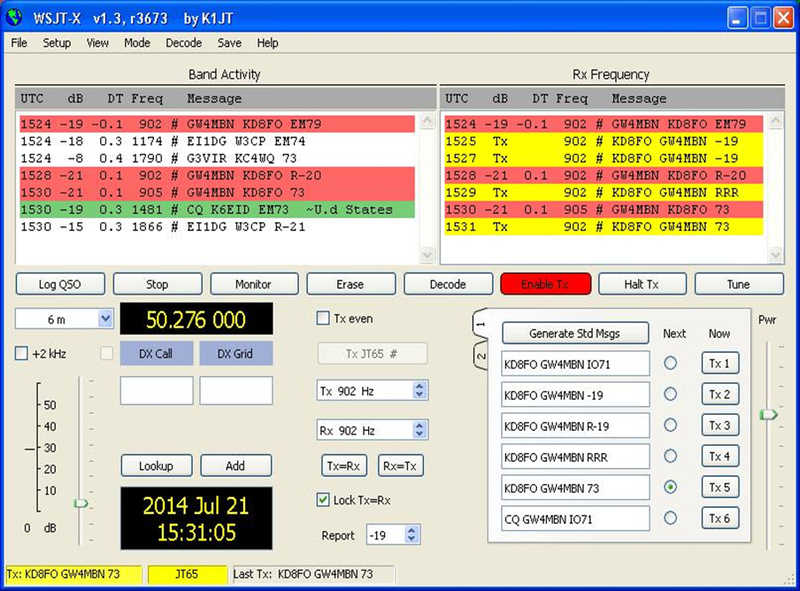 This mode was designed to replace JT6M, but particularly in Europe, JT6M is still very popular. Calling frequency is usually 50.235 Mhz, though 50.320 Mhz is increasingly used. In my experience, ISCAT is slightly more sensitive and works very well for MS but is also ideal for weak signal TEP and Transatlantic Es work. With ISCAT mode it's best to wait until the end of the 30 sec period for the software to compute the average. Clicking in the spectrum during the period will not decode as well. These modes use a faster data rate than JT6M and ISCAT and therefore use more bandwidth. As in all radio comms, there will be a trade-off between bandwidth and sensitivity. 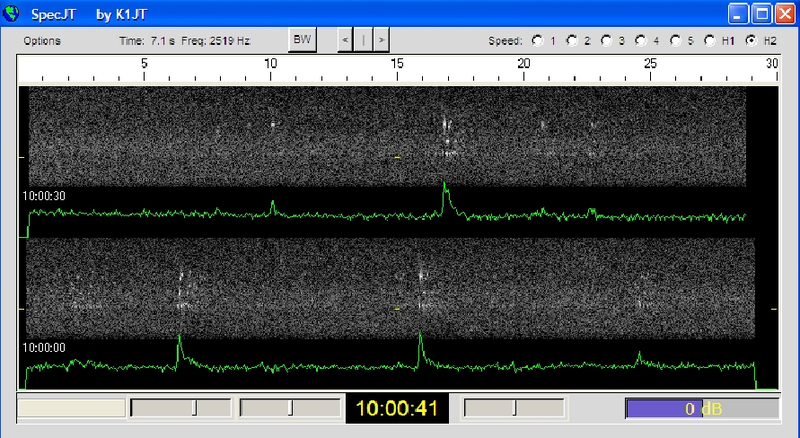 FSK is more commonly used on the 4M and 2M bands, but can help in decoding very short pings on 6M. These are the "Slow" modes, using a complete 60 second period to transmit the message. JT65 was originally designed for EME work but, along with JT9, is also very popular for weak signal and/or low power work on HF. JT9 is very narrow band, one tenth the bandwidth of JT65. Both these modes however are also used on 6M for weak Sporadic E, particularly trans-atlantic. 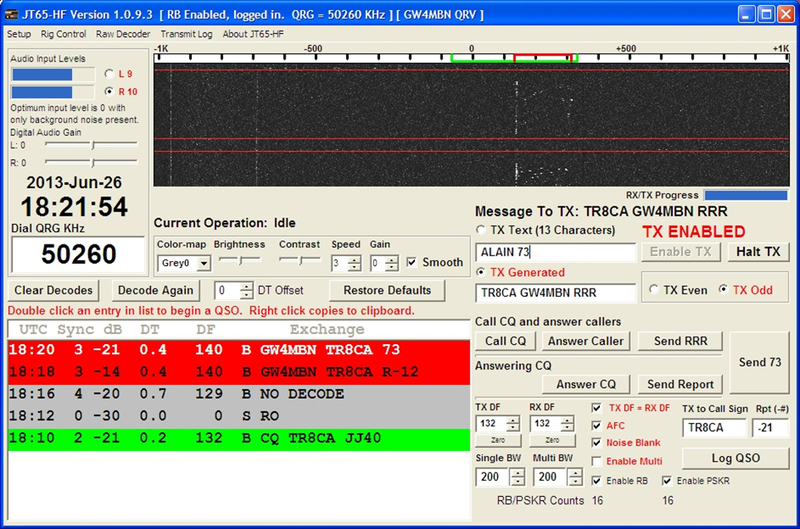 JT65 is included as part of WSJT 10, but is also, along with JT9, in the WSJT-X software. Calling frequency for JT65A is normally 50.276 Mhz, and for JT9, 50.278 Mhz. For all these modes it is important that both stations are time-synchronised within less than 1 second, to ensure successful decodes. A small utility such as Dimension4 should be installed. This can run in the background to lock your computer clock to one or more time servers. Chat sites such as ON4KST.org are useful for setting up skeds for MS contacts, but it is much more satisfying to initiate a purely random contact from a CQ call. Of course, never post a signal report on KST during a QSO - it is meant to be a radio contact, after all. 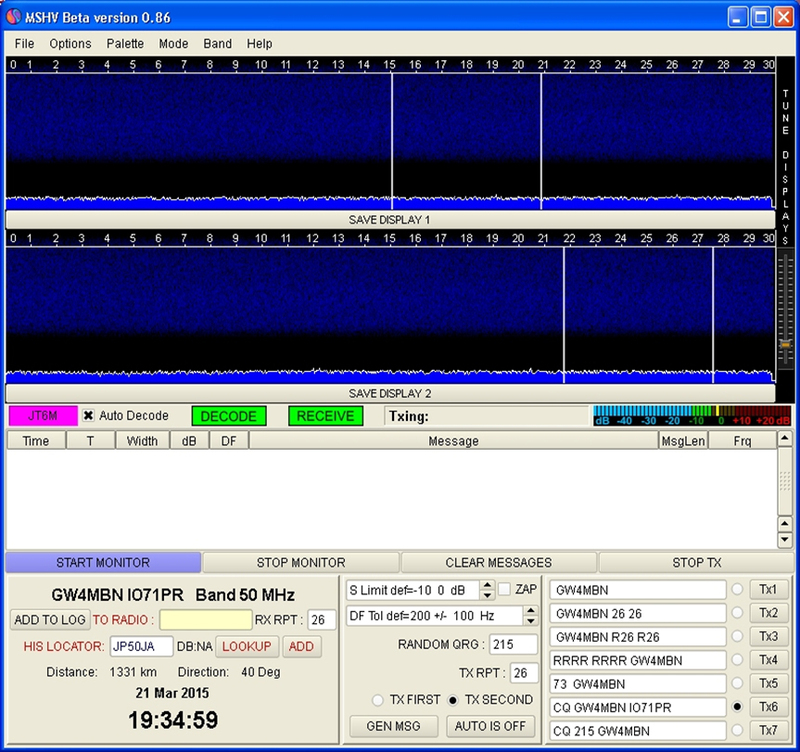 In spite of it's name JT65-HF is often used on 6M for weak Es, TEP and Tropo contacts. This package by Klaus DJ5HG is a totally different meteor scatter mode which uses strong error correction to produce perfect decodes with no "garbage". It can also be used in full auto-mode. 6M calling frequency is normally 50.260 Mhz. I've used it with great success on 6M and 4M. It's a shame it's not more widely used at this time.